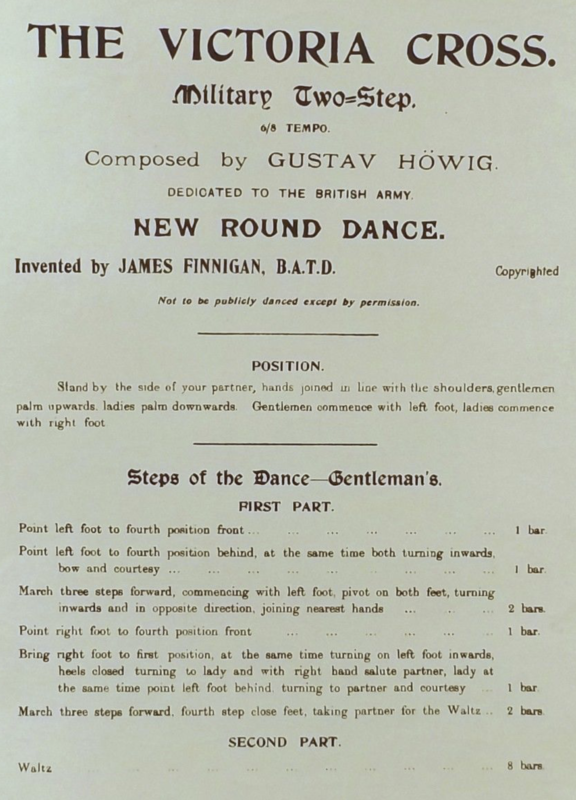 This is an early English sequence two-step composed by James Finnigan in 1898 in honor of the British army. In a later source, it was called the Military Two-Step (Victoria Cross) [FD08], and in the mid-20th century, it was known simply as the Military Two-Step [VS50]. Part I - Point, Honor, and March (4 bars): Point outside foot forward along LOD (1), then point outside foot back against LOD, turning inwards and honoring partner with a bow and courtesy (3). Then walk three steps along LOD, pivoting on both feet to face against LOD on the fourth count (5, 6, 7, 8). Part II - Point, Salute, and March (4 bars): Point new outside foot against LOD (1), then the Follow does the same (point behind and courtesy) as the Lead closes heels together and salutes partner with his right hand (3). Then walk three steps against LOD, closing feet without weight on the fourth count (5, 6, 7, 8). Part III - Two-Step (8 bars): Four full turns of turning two step (1-and-2, . . . 15-and-16). 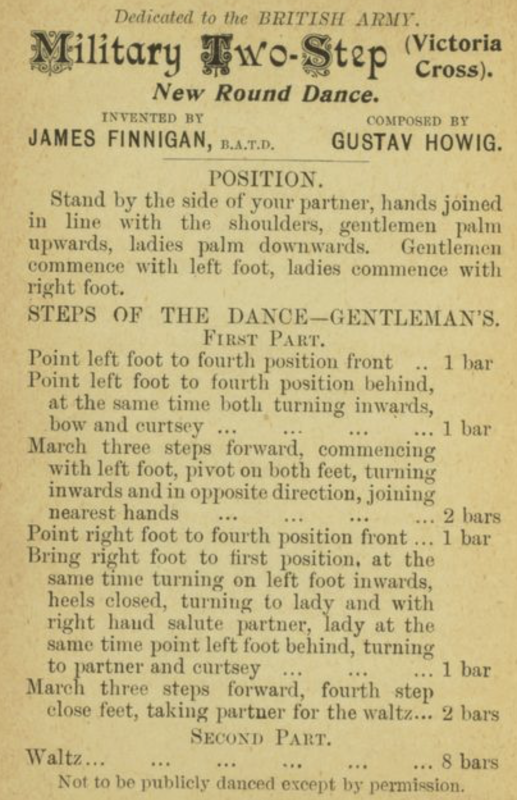 There's an eponymous tune composed specifically for the dance by Gustav Höwig, but any square, late 19th century two-step will work nicely. James Finnigan. (1898). The Victoria Cross, Military Two-Step. London. Francis & Day (pub.). (c. 1908). Francis & Day's New and Original Ball-Room Dances, Containing Full Descriptions of All Their Latest Prize Dances (Enlarged Edition). London.